I've been a pagan and a witch for going on fourteen years this September. It's been a long road of self-discovery, research and questioning. Over that time frame, the label that I've given my beliefs has changed drastically as I've encountered new words to describe my religion. Words have come and gone from my vocabulary, including humanistic and atheistic; words I will define in this entry, yet somehow no longer define my religion and practice. But one word has stuck around. Up until recently, while I've strongly identified with it, I never thought to bring it to the label of my Craft. That's because I wondered if something like nontheistic paganism or nontheistic Witchcraft exist. But they do. Oh, they do. WHAT IS NONTHEISTIC PAGANISM AND NONTHEISTIC WITCHCRAFT? Definitions are a tricky thing. As I've mentioned before in this article, it's hard to define paganism and witchcraft, let alone different denominations, because religion is a very personal experience. There's no one book for paganism, no one book for witchcraft, that explains what everyone should believe. Just the same, there's no one book for nontheistic paganism or nontheistic Witchcraft. Those who come to label their beliefs as such have personal reasons for doing so. Take the following definition(s) as my personal experiences with nontheism in the community. Nontheistic paganism and Witchcraft typically represent a section of pagans and witches who do not worship deities as a spiritual entity with power and control over all of their worshipers. You might think that nontheists don't believe in deities at all, and while that is true for some nontheistic pagans and witches, many other forms of nontheism exist in the community. Perhaps deities still exist, but not as the divine. Those who believe this can still call upon and utilize deities in the same way, say, they might call upon spirits in ritual. Still others believe they're metaphors for human emotion and traits. These pagans and witches use symbols of the deity in ritual and on altars, connecting their image with a certain meaning or power. However, nontheistic pagans tend to have one thing in common: They don't consider deities to be deities in the most formal definition. WHAT IS THE DIFFERENCE BETWEEN NONTHEISTIC, SECULAR, ATHEISTIC AND NATURALISTIC PAGANISM/WITCHCRAFT? Atheism usually defines someone who does not believe in any entities. Atheists tend to believe that gods and goddesses do not exist in any form. Typically, atheistic pagans and witches believe our ancestors anthropomorphized that which they did not yet understand to create gods and goddesses. Secularism typically defines someone who separates religion from paganism. They believe Secular Paganism is "an ethical view of the world, based on the belief that Nature is sacred and must be respected and treasured." For those under this belief, paganism becomes more of a philosophy than a religion. One could argue that Witchcraft itself is naturally secular. Naturalistic or Humanistic paganism relies on empirical evidence and scientific backing, emphasizing skepticism and a belief in the natural world. When it comes to deities, naturalism implies that they do not exist in any form because there is no scientific evidence to suggest they exist. The reason many nontheists choose that term over other similar terms, such as atheistic, secular and naturalistic, is that those terms tend to imply someone who doesn't believe in deities also can't believe in other supernatural aspects. Nontheism defines a lack of belief in deities as they are typically defined, but the term doesn't reflect any other disbeliefs. Though I've said it before, I'll say it again: Not believing in deities is not the same as not believing in the supernatural or spirituality. A nontheist can believe in any number of supernatural entities but simply not believe in deities. Or they may still believe in deities, but just not quite the way deity is typically defined. It's all up to the individual. However, just because someone doesn't believe in a deity doesn't mean that they'll begrudge others who do. Quite the opposite, nontheists see a certain beauty in the history, culture and stories of deities. That's where we find our connections to theist communities. In fact, I find it important to always incorporate some sort of calling to deities, spirits and other entities in every ritual we do with Circle of Fountains. My circle is interfaith, and thus many of my circlemates do believe in deities. I have never once seen them as less than, by any means, and balancing my beliefs with theirs is imperative to our functioning as a group. I'd also like to take a moment and mention that my being nontheist should not change your view of my blog, my writings or cause you to unfollow or unsubscribe. I will always write my articles so that anyone of any faith could come to my blog without feeling alienated. I have always been nontheistic, even when writing my very first blog entry way back in 2013. So please don't let this change how you come to my blog; everyone, theist and nontheist alike, is welcome! HOW DOES ONE PRACTICE NONTHEISTIC PAGANISM AND WITCHCRAFT? I have struggled with this question literally my entire life. My community and many of my friends are theistic, and the world in which we live places an emphasis on deity. Most texts you'll read for paganism and witchcraft are going to call upon some sort of god or goddess. I've seen books that claim secularism do this and have wanted to throw them against the wall. This is where you have to truly search your soul, define your beliefs clearly and get creative. A dash of luck helps too. Once you get going, you'll find that there are many ways to practice nontheistic paganism and witchcraft. It really just all depends on your personal core beliefs. There is no one set of beliefs for this kind of paganism or witchcraft. Even more so, nontheism can apply to just about any denomination of paganism that doesn't absolutely require gods and goddesses. That means that nontheistic paganism remains an umbrella term for many different religions. Before I begin with my beliefs, it should be noted that not all religions are going to be as accepting of nontheism. For example, while nontheistic Wiccans exist, the very nature of Wicca almost necessitates duotheistism and thus it makes it really difficult to be nontheistic in that case. I'm not saying you can't; I'm just saying that you're going to struggle a lot more that you already are being a nontheistic generalized pagan. MY PERSONAL BELIEFS - MY VERSION OF NONTHEISTIC PAGAN WITCHCRAFT. 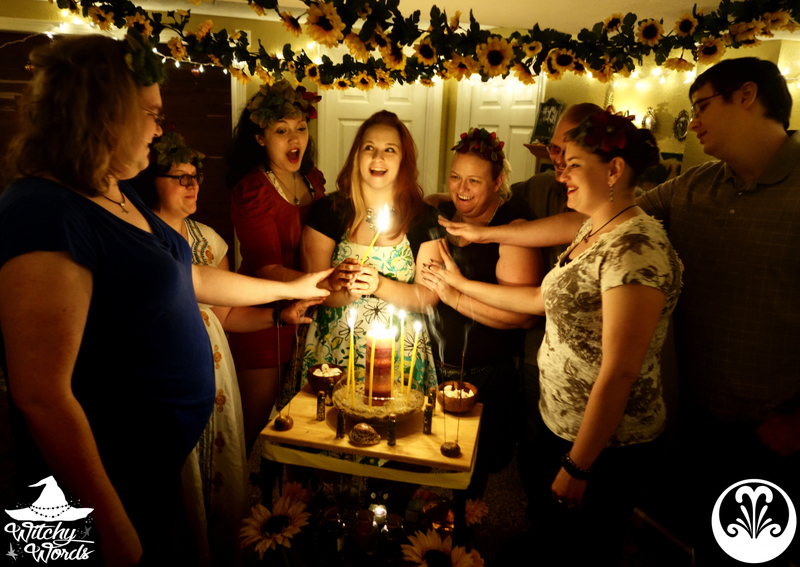 Let's start with probably the biggest part of being an eclectic pagan: The Wheel of the Year. 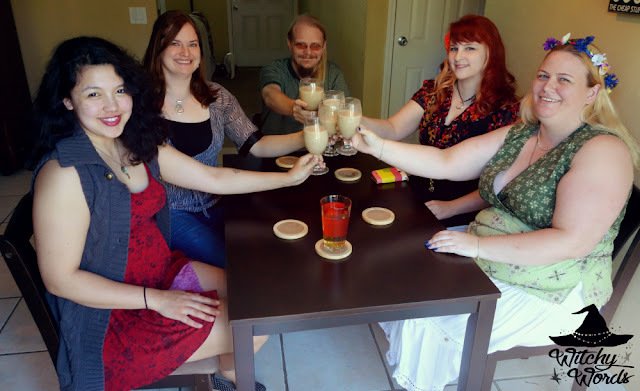 Not everyone follows it but, if you join a community, they'll likely be meeting for the sabbats. The Wheel of the Year makes up a huge part of my belief system. Finding a way to celebrate them without gods or goddesses has taken some time. Imbolc was probably my biggest struggle. "Brigid is the reason for the season!" my community screams, and I clap along with a blank stare on my face. The important thing to remember is that each sabbat will have gods and goddesses associated with them. Some of the holidays were formed around certain deities. I cannot stress how important it is that you know the history of each holiday and why that particular entity is being celebrated. Just because you don't necessarily believe in a deity does not give you a right to disrespect the culture and history being exemplified by your community. As a pagan, you can't just ignore deities, refusing to study them because they don't fit your worldview. Samhain: Last harvest, reverence for the dead. Midwinter (Yule): Longest night, winter, the dark. 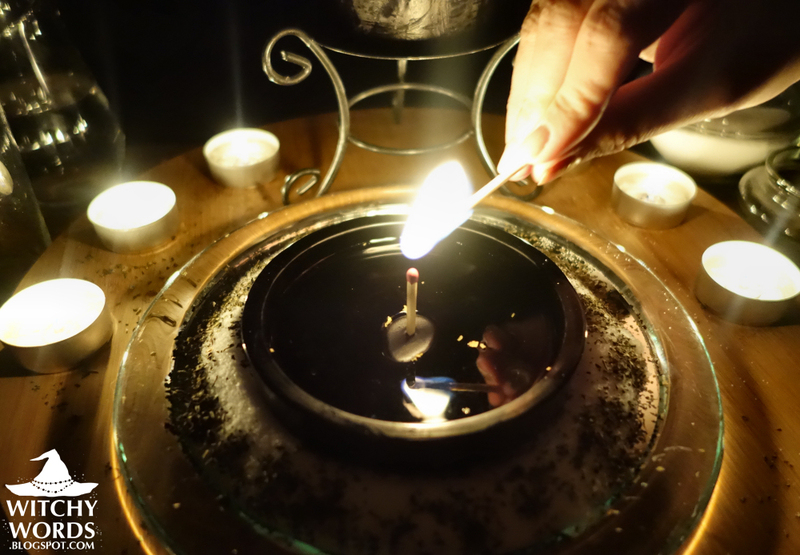 February Eve (Imbolc): The spark of light in the dark, the melting of snow, awakening. Spring Equinox (Ostara): Equal night and day, balance, fertility of the land. May Day (Beltane): Marriage, love, fertility of the people, fire. Midsummer (Litha): Longest day, summer, sun. 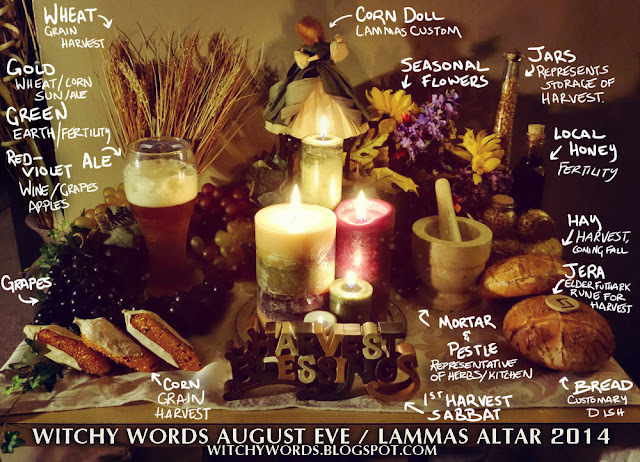 August Eve (Lammas): First harvest, wheat and corn, the waning of the light. Fall Equinox (Mabon): Second harvest, equal night and day, apples and grapes, thankfulness. While some pagans may consider this a bastardization of the Wheel of the Year, this version has helped me get through the most important part of my beliefs as a nontheist. There's certainly more to each sabbat for me, but this basic list can be used as a springboard for another's research into nontheistic paganism and the sabbats. Why exactly are nontheistic pagans and witches having rituals? To accomplish an end goal. Maybe that end goal is spellwork or celebrating a sabbat or honoring someone who has passed. But, even for some theists, deity isn't required for any of that. The same goes for nontheists. For nontheists, ritual doesn't change meaning. It just sometimes changes shape. The typical community ritual is going to call upon the four elemental quarters and then some sort of god, goddess or both. So how does a nontheist connect to a ritual that's about a deity he or she doesn't necessarily believe in? Again, by knowing the history and culture around that deity. We connect to the story, the metaphor, the psychology behind the entity. Personal rituals will likely do away with calling upon a deity. Some rituals may do away with calling upon the elements. There are so many ways to form a circle that it'd be impossible to list them all. And, even if I did, not all nontheistic pagans and witches form a circle for ritual. Even for my personal beliefs, I don't always need a circle. In fact, the only time I form a circle is usually with my circle, Circle of Fountains. As I was writing this article, I was asked about how to set up a nontheistic altar by wicca-vibes on Tumblr. Frustrated with the constant incorporation of deity in altar diagrams, they were lost on how to set up an altar not related to an entity. If you don't believe in deities, they asked, then just what exactly "do you "dedicate" your altar to?" 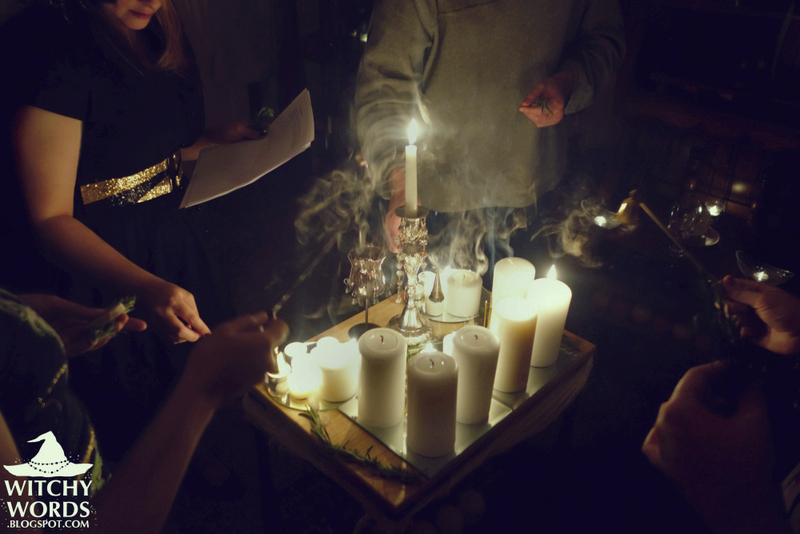 For nontheistic pagans and witches, altars are meant to bring a certain energy to a space. Altars don’t have to just honor deities - they can honor an emotion, a certain space, the memory of someone who has passed or the holiday that you’re celebrating. Nontheistic altars achieve this through symbolism, arrangement, nature and magick. You can use a variety of items from gemstones, flowers, herbs and candles to figurines and items that represent your goal. Also keep in mind that gods and goddesses can be metaphors for human emotion. If you’re looking for something that emphasizes love and fertility, there are many, many gods and goddesses that represent that. A word of caution: I would only use god and goddesses as metaphors if you still have respect and knowledge of their history. Don’t just throw Aphrodite on your altar because you’re wanting something for love and that’s all you really know about her. If that’s the case, I’d simply steer clear of all deity representations. I utilize four kind of altars in my practices: Sabbat altars, ritual altars, house altars and spirit altars. Sabbat altars invoke the secular meaning of the sabbat, relying on symbolism to represent what's happening in the natural world. Unlike some denominations of paganism which require altars to be set up a certain way, my sabbat altars don't have a formula. I instead combine symbolism with aesthetics. Ritual altars are set up to be used during ritual, so they typically have a practical arrangement with some aesthetics and symbolism. I may set up an altar entirely made of candles if we're mostly lighting candles for ritual. If we're doing something more, such as lighting incense or using vials of herbs, I'll add that to the altar. If I find I have some room after I place the practical, consumable items on the altar, I might decorate it a bit. If not, then my job is done. 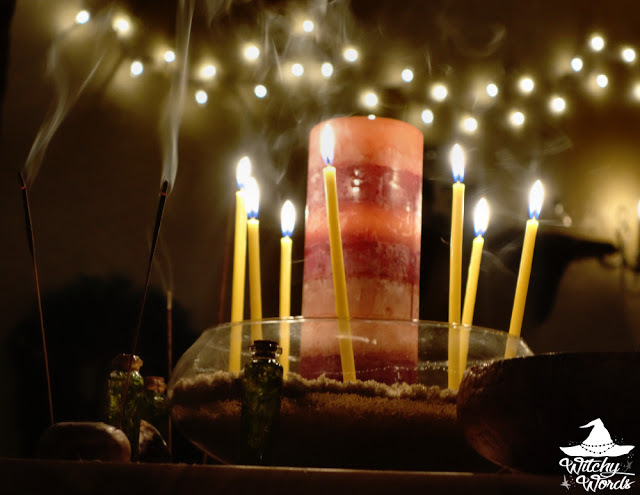 House altars bring a particular energy to a room, honoring and blessing certain aspects of our lives. 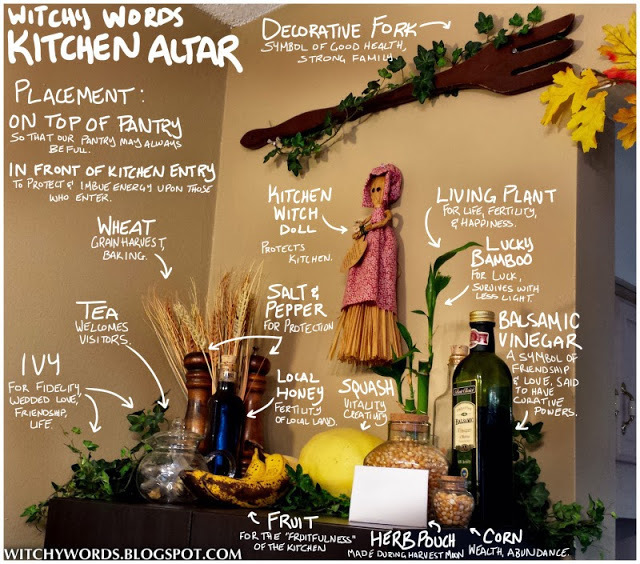 I keep a kitchen altar because we've had many times where our pantry was bare and our pockets too empty to fill them. However, you might have a living room altar that invokes happiness and togetherness, or a bedroom altar for peacefulness or fertility. Spirit altars are created to honor and work with spirits. 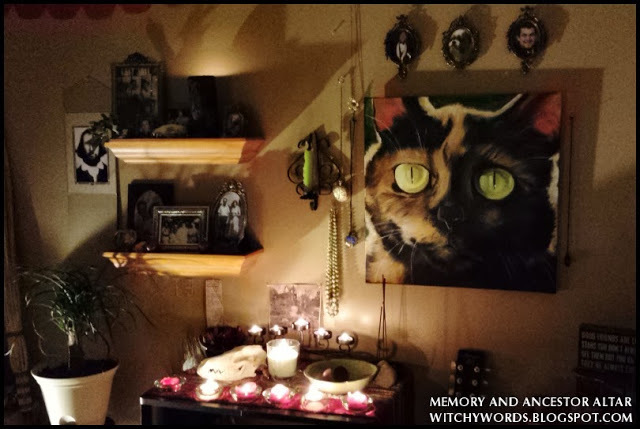 I personally have a memory and ancestor altar in my altar room. One side honors my ancestors through pictures, jewelry and news clippings. The other side honors friends, pets and familiars who have passed away that meant a great deal to me. I have it set up in the northern part of the altar room, a direction associated with earth, which we all return to when we pass. If your belief incorporates spirits, you may find this type of altar helpful. If don't believe in spirits, a memory altar may help you psychologically deal with the grief of losing a loved one and thus still may be relevant to your religious and spiritual beliefs. If you're nontheistic and looking for a certain kind of spell for your needs, you're bound to run across 20 spells that incorporate deity before you find one that doesn't. Witchcraft is a practice and thus I find it nontheistic on its own. However, Witchcraft is infused in so many religions that it's hard to separate the religious aspects from the practice. This is particularly true when reading books written by pagans who incorporate spell work. Most nontheists would advise to simply remove the deity calls from the spell, but that's not always practical. Sometimes, removing deity leaves very little of the spell left. While knowing the history and symbolism of the deity can help, some spells are still not salvageable for the nontheist. That's why it's so important that nontheistic witches have a solid foundation of correspondences, symbolism and spell craft so that they can create their own spells for use. Spells you write yourself are going to have more power for you than a spell you pull out of a book or off of a website. Some may question why one would come to paganism, or any usually-theistic religion, with a nontheistic or similar view. What role does religion play if one doesn't believe in a being bigger or more than themselves? In fact, if you Google "what is religion," Google will tell you that it is "the belief in and worship of a superhuman controlling power, especially a personal God or gods." What is the point of religion without gods? Personal growth. Religion in any form, even nontheistic religion, gives us ways to grow that we may not thought of before. It gives us a chance for reflection, for happiness, for a spiritual fine-tuning. Direction and rhythm. Being a pagan gives me a clearer path to follow on my life. The Wheel of the Year offers a rhythm - days that carry more weight, greater significance. It offers a pattern, functionality, and direction for those who may otherwise feel lost. Deity not required. Self-affirmation and adaptability. When things go awry in our lives, religion gives us stability to come back to. It allows us, through personal growth and direction, to reassert ourselves and our place in the world. It provides consistency during times of change, yet still gives us the ability to change with it. Just because one doesn't believe in a god doesn't mean that they can't still get all of these things through religion. Community. Not all nontheistic pagans are solitary, and those who aren't can find community through religion. Though many of my community are theistic, paganism unites us and it's a beautiful, sacred thing. It should be noted that all of these things can be found through other means. Witchcraft isn't a religion, yet nontheistic witches feel somehow better fulfilled through their practices. However, those who seek religion, even a religion without a god, are looking for these aspects that they may not otherwise find in their lives. For these people, religion has a very important place. And that, in and of itself, gives it a "point," a reason to be. With or without a god. Some of the resources linked below are about atheism, naturalism and secular paganism. These links will give you a clearer perspective on the differences and similarities between the four. Enjoy! Am I a Secular Pagan? John Halstead: Are the gods real? Plainly Pagan: A Spiritual Non-Theist? Nontheistic Ritual: Is it effective? I consider myself to be a Pagan Agnostic, with the belief that the energy is out there and may or may not be sentient. That we project ourselves upon the energy giving it the appearance of deity so that such beings are ore a reflection of ourselves, hidden or overt. Give some pretty interesting thoughts about some religions, I admit. But I think you have found yourself an excellent path, I wish you well. Very interesting. Thank you for reading and likewise! I've noticed in the wider pagan community, there is an emphasis on labeling. All religious communities do it, but it seems to be a need to identify oneself as a Hellenist, or a Spiritualist, or a Wiccan. And then, what kind of Hellenist are you? 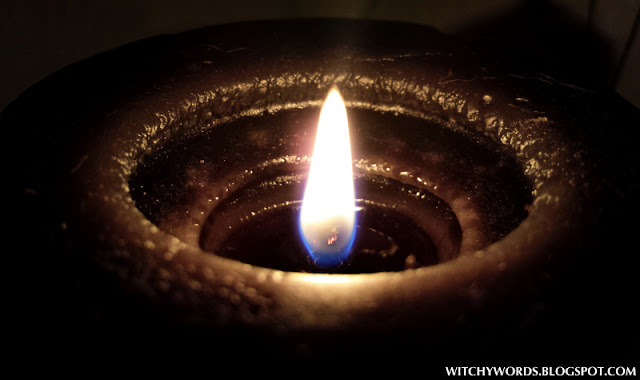 What kind of Wiccan are you? I wonder if this tendency is because neopaganism has such a broad spectrum. If you're Christian, whether you're Catholic, Mennonite or Baptist, you share the same core beliefs (Jesus died on the cross for you sins). But as you pointed out, neopagans have no such central doctrine. 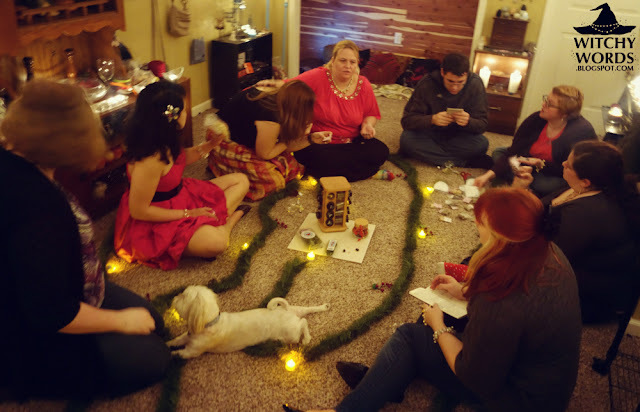 We like to think there is little dogma in the pagan community, but sometimes I feel like we are expected to chose some particular path, label ourselves with whatever we want to call it and stick with it. If you're Wiccan, you better not go around practicing Druidism unless you start calling yourself a Druid. Anything less than total devotion and self-proclamation to one particular branch of neopaganism is "cultural appropriation." It leaves little room for experimentation in some ways. I think you hit the nail right on the head: Neopaganism is an umbrella term for so many incredibly different religions that labeling helps you find like-minded individuals. However, labeling is absolutely not necessary. I most often get labeling questions from new pagans and witches, and I typically tell them not to worry about their label - that it's not truly important. However, if you get a Wiccan, a Satanist and a Kemetic in the same room, none of them are going to believe the same things. Yet they're all pagan. That's the struggle that I think a lot of us face when we're involved in any kind of pagan community. For me, I didn't label myself as something and then started believing it. My label has changed over the years to better describe what it is that I've believed all along. It doesn't stop me from celebrating with those who have differing views, but it helps me better connect to those who have similar ones. I won't go into cultural appropriation as I'm sure I'll end up offending someone about it, but I do think the Tumblrian generation has gotten a touch trigger happy with that word. I ended up going into a lengthy rant here about my mom's ethnicity and mine appearing to be so different because I ended up with my dad's ghost-white skin and the fact that I tend to get "cultural appropriation" screamed at me every time I use elements from her ethnicity, but I backtracked it. Maybe some other time. The point is that there's moderation in everything. As long as a religion is not closed and you're doing whatever it is that you're doing respectfully, I don't take much issue. Thank you for reading and your insightful comment! It's always a pleasure! I am an eclectic pagan, I use several different pantheons, namely Celtic (I'm Welsh, Hindu and Greek, some Native American but I have also looked into Santeria, Vodoun etc. )-I believe as long as you show respect and a genuine eagerness to learn then there should be no problem, as not judging others paths should be one of the first steps we take on our spiritual journey. What is a comfortable way in which to connect with spirit should be the priority, and we can have many different reasons to be drawn to a particular deity. I never really understood cultural appropriation from a Pagan perspective as many believe in past lives. What if you had lived 1000 years as say a Greek, I for example am very drawn to the history of the place and I don't really care if say a Greek said I was appropriating for in my eyes it could be their 1st life as such. There is a different perspective from Pagan eyes and each should have the freedom to choose their path, only we know what is right for us. Pay those no mind. Deities are one of those things I have struggled with over the years. Even as a small child I didn't understand the belief in some supernatural, invisible being in the sky. To this day I still cannot. I like the idea of them though and believe that they exist only in our minds. I am a very scientific person, so much of the supernatural aspects of paganism conflict with some of my views of the world. However, I do know witchcraft works as it focuses your mind and intention to bring about real change in your life. Psychologists from around the world have proven this to be true time and time again. Despite being so scientific minded, however, I am able to believe in things spiritually. Spiritually I believe in astrology; scientifically I do not. Spiritually I believe there are faeries in my garden, a Tomtee in my kitchen, and that my dreams have real life meaning. Scientifically I don't believe any of it to be true. I think the world would be a much happier place if more people could separate their religious and spiritual views from actual scientific thought. Like you, I initially struggled to celebrate the holidays and still do, but for different reasons. Holidays aren't fun when you are the only one celebrating. My husband has no understanding of my spirituality, despite my many attempts to explain it to him. We actually just got done discussing this in the car. I told him it isn't a religious ceremony or anything like that, but instead a celebration of the changing of the seasons. The Earth deserves to be celebrated; I just need to show him that. As always a very lovely and informative post. I hope many people read it and realize they are not alone in their beliefs. More and more pagans are turning away from the deity centered path, and thinking they are making the journey alone. Very untrue. I went to a pagan celebrations years ago and was SO out of place. I am an extrovert and many of these people were not. They were very cliquish and totally set in their ways. I've tried many times to celebrate with other pagans, but I'm always left feel uncomfortable. I tend to throw general parties for the sabbats to celebrate secretly with friends. They enjoy the free food and alcohol. Haha! Thank you so much for sharing your experiences! I've seen Atheopaganism before as a relatively small religious movement and, while I'd love to add it here, I found that it didn't quite relate in the same way that Naturalistic, Atheistic, Secular and Nontheistic does. Atheopaganism has a set of rules and a cohesive following with a constructed head figure - someone who created the religion. Naturalistic, Atheistic, Secular and Nontheistic are tags anyone can use to better describe their belief system without having to follow a specific set of rules or manifesto. I'm sure Atheopaganism is still open and perhaps the guidelines set by Mark Green aren't in stone - or maybe they are. It just didn't quite fit the other kinds of labels I wanted to outline. That being said, at some point, I should start collecting denominations of paganism, their definitions and links for readers looking to better define their path. Your post helped remind me of that. Thank you again for reading and for your feedback! I truly appreciate it. Hi--the guidelines for Atheopaganism are NOT set in stone! It's just a Pagan path that many are now following--our Facebook group is now pushing 1,000 members. Materials and writings on the Atheopaganism blog are valid and useful for any nontheistic Pagans, and I certainly don't see myself as a "head figure"--just as a co-creator. I welcome your readers to come by and check out the resources and thoughts at atheopaganism.wordpress.com. Hi Mark! I appreciate your comment and clarifications. On your website, though, you state in no uncertain terms that you conceptualized Atheopaganism on your own (I'm looking at it as I type this). As such, followers of such a religion will see you as an authority on it. I'm sure Naturalists, Atheists, Nontheists and the like could benefit from taking a look at your site and perhaps joining your Facebook group but, again, this is a created religion rather than a self-identifying tag and I'd prefer to deviate from such religions in my post. Thank you again for commenting! Hi Marietta! (Sorry if this shows up twice...I think it ate my first comment) I always enjoy your posts, but this one really, really hit home. I'd been interested in Witchcraft and Paganism for years before I started my current path but always got stuck when it came to deities. As a former Christian, I didn't like the idea of still worshiping deities (however cool and helpful). Then I found Mark Green's "atheopaganism" (which Lesley mentions above) and read his manifesto. It wasn't a 100% match, but I was SO RELIEVED to find there were others who felt like I did. That not centering my faith around physical, sentient deities didn't make me a huge fraud. That it was still soul-fulfilling path for the very reasons you listed above. I have a similar list in my BoS as an answer to "why" and "why this path." Huge hugs to you for continuing to be a fantastic positive resource for the community! I completely agree and have very similar experiences. I prefer spirit work and associating with energies over the concept of deities. For that reason, words like Atheistic, Naturalistic or Secularism just don't quite fit the bill. Nor does Atheopaganism. I'm pretty sure energy and spirit work are left out of many of those labels. Nontheistic is the best word I've ran across yet that describes my beliefs, and it's a relief to know that I'm not the only one! Thank you so much for your feedback! I truly appreciate it. THANK YOU for sharing this, Marietta! I struggle with labels, because I've always been a "spiritual" person, but I felt kind of like a victim growing up in one of the three "major" religions, believing in "God." It took me a long time to let go of some of the beliefs I was fed as a child, but I'm really finding my happiness in venerating the Earth and the Universe in general. While I love the beauty and psychology associated with gods and goddesses, thinking of them as higher powers that are "better" than us, or having control over our fates just feels like the same thing I was fed as a child, re-packaged. I love the idea that people can be "good," happy, healthy, and tolerant of those around them just for the sake of raising the vibration, with or without the fear of angering or pleasing a "god." Like you, I also rejoice in seeing others believe in and honor the gods, and who knows, maybe one day I'll understand that first hand... But either way, it's great to hear that there are others like me who believe in themselves, and know that that is enough. Great article! I'm in a similar position! I lean more atheistic in my views of gods, but atheism tends to also imply some sort of disbelief in anything supernatural or spiritual. It just doesn't fit the bill for me. However, watching my friends celebrate their gods and goddesses is amazing and beyond words. I wouldn't trade it for the world. I'm so glad you enjoyed the article! Thank you for commenting! I never realized that this was how I identified myself until I read your post. Having been a solitary practitioner my entire path, I've only had what I've found/read to base my beliefs on. I've, of course, tailored my practices to reflect what felt right to me and what I could accomplish, but I never realized that what you have described in this post is who I am and how I believe. Thank you! I'm so glad I could help, Lyn! There's a surprising number of us out there. I wasn't aware until I started officially identifying that way. If this article can help someone else find their identity, then it's done its job. Thank you so much! This is fantastic and I already shared it to my Facebook so my friends can attempt to understand me better. I have long used the term Naturalistic Witch or Pagan even though it was not a 100% fit, I believe in spells/Magic and fate. Non theistic makes sense. :) I revere and honor The Universe/Nature, I believe the changing of the seasons are what is important and going within during ritual to connect to my inner/deeper self. I am working on a book on the subject and have a blog called -In The Witching Hour- its on here. somewhere! I am also going to bookmark your blog and become a new reader, I will start with the very first post because I like to go back and see what I have missed. Many Blessings to you for writing such a lengthy post and being so informative. Glad to see others of like mind. This was a wonderful post and beautifully written. It's nice to know there are others out there that hold similar beliefs to mine and to not feel so out of place. I've attended rituals and groups and very early on in my journey I was in a group where each person had to say the diety they were calling upon and honoring. They named Ganesh, Jesus, Diana, to name a few and I had no answer .It's not that I didn't know their stories or study them, I just didn't believe in including any. It left me wondering if I was doing it wrong, but over the years I found I'm doing it just right for me. Thank you for this post!! THANK YOU! This has helped me not feel alone on my pagan path! I cannot thank you enough for this post. I have had the hardest time honing my craft because so much of the information I come across involves the invocation of, and belief in, various deities and god figures. This has never sat well with me because while I believe in a spiritual element, I do not believe in unseen, controlling forces. This post has opened my eyes so much, I have read it several times now and I believe we are on the exact same page. I no longer feel like a fraud or a phony when practicing my craft. This post is so amazing! I always felt the exactly same way. So much that reading it was actually weird. It felt like someone was reading my mind. Nice I think I follow you on Tumblr. I don't worship any deities but I believe in their existence. I just haven't connected to the Devine in such a way. I do work with nature, elementals, and spirits. I just don't feel right calling upon a god or goddess for only a certain spell or time being. I just feel that is disrespectful. I also have heard of stories of worshippers upsetting the Gods. I have enough stuff going on in my life to have to deal with the wrath if the gods. I don't mind if one comes calling but one has not. That being said I don't practice often as I use the craft as a last resort. I just happen to stumble across your blog from a Facebook post and it caught my eye. Very interesting and well written. I enjoyed it and some of it resonates with me. I wasn't raised with any religious beliefs growing up so I started to develop my own, then started studying/researching many other religions. I don't associate with one, but with many, even belief in aliens. All religions are man-made beliefs and faiths, which are fine, but I find some Truth in them all. I don't worship any Goddess/God or deity either. I believe that there is an entity above us & that entity is within us all, that we, as individuals, are a unique cell that makes up this universe & our Mother Earth, life after death, reincarnation, that our governments try to control us, that when each individual consciously & spiritually wakes up we find the truth, our individual truths! I believe we are still evolving. Some of us are Indigos, Lightworkers, Starseeds, Crystals, etc., etc. I consider myself an eclectic spiritual person. Always learning & growing & finding my own truths. Thank you for the good read. Thank you so very much for this article. I didn't realize I was leaning that way myself until very recently. I have one small negation for your article, however. Atheism, on it's face, is not the claim that there are no gods, as you seem to suggest here. Atheism is the default position. It is the rejection of the claim that gods exist. There are "hard" atheists who like to say there's no such things as deities, but that is a subset to the disbelief of the individual. I hope I explained this properly. Thank you again. I was also pretty much spoon-fed the protestant belief, practically since birth. I rejected it as soon as I could. And I have pretty much flirted with paganism for the last twenty or thirty years. I, like all the others who have commented, don't feel I could ever believe in any kind of deity. But I do think I've become a pretty spiritual person. So I think I'd say I'm a non-theistic pagan, although I'm not sure if I could add the witch part or not. i will begin with, i'm not a blog person... most blogs i find are hard to navigate through and if i don't find the information i'm seeking, i move on. i clicked on your blog from that top 75 witchy blogs article i came across on FB. YOU are a wonderful find! So my mother was born on May 1st. my sister came home one day and said something about being witches because of her birthday. at first i was taken back. in my young pre-teen years i had hollywoods image of witch in my mind... but then my mom explained it to me, very basically, and from there i was hooked. it sounded beautiful! it's been slow going, and a part of me didn't feel like i was doing it right. i wanted to believe in this path but i still couldn't get the concept of "god" or "goddess" or any spiritual being on that kind of level. the fact that i was supposed to believe that i wasn't in control of my path was absurd! but other than atheism, i didn't know what to call it. and i knew i wasn't an atheist. so i dabbled a little with candles and tarot. i was fine with calling myself a spiritual person but i felt a loss of words when someone asked me what i believed in. and would try to explain it but i think they would just nod their heads and smile not knowing what i just tried explaining! so i sort of stopped... my 20's were filled with craziness that i didn't have time for spirituality and the sorts. for the past few years i've been finding pieces of myself, my tarot deck and a handful of books i had bought way back in the day to try and help me figure out what it was i was looking for. (they were mostly irrelevant by the way) and with the internet at my finger tips i found determination to continue on even if i was crazy with my beliefs. i figured who cares what they say, these are MY beliefs! it's still slow going with a 2 and a 6 yr old. but i find i want to get them involved in some aspect. and i will keep an open mind if they choose to believe something different later on. OK soooooo that was longer than expected and maybe i've been holding that in for awhile! But i would like to thank you for putting your beliefs out there. i know i'm not alone in what i'm searching for and you explained it very well. i was going to do it my way anyway but i guess a little affirmation doesn't hurt! so thank you again! Great to see such questioning and openness in your blog and among all the folks commenting here. That's a major reason I'm a Pagan: I believe in experience, not in blind faith. No one should accept what others say a God or Goddess is or does or whether or how They exist unless you've experienced Them -- and don't make up your mind until or if you do. That goes for myths and statues and such, as well, all of which tell you no more about Them than your name and your clothing and the gossip about you on social media tell someone who's never met you who you really are. Next question: do ghosts exist? Hard to deny the empirical evidence that they do, and that many of them exhibit will, choice, self-direction, just as they did when in a living body. If ghosts can exist in such a way, then the "I" must survive in some form beyond death -- it is a "soul". By the same token, if you have experienced past lives and read any of the wealth of objective evidence for their reality, you would have to conclude that this soul also existed before birth -- and is therefore immortal. Then if your soul exists and is immortal, what schizophrenic hubris would it be to assume it is the only one? And if there are other such trans-corporeal entities out there, what arrogant hubris would it be to assume that none of them are any more petty and bumbling than us humans? Or to assume we could possibly know and understand all of what they are and do and care about purely based on our own limited images and words? Anyway, as a Pagan in a tradition that practices Deity possession (Gardnerian Wicca), I observe over and over again how two millennia of Christian monotheism and three centuries of scientistic (that's a real word) materialism have profoundly poisoned our Western understanding of Gods and Goddesses. It takes an awful lot of magic to get past that!!!! While I appreciate the discourse on this subject, I would encourage you to avoid suggesting that atheism, nontheism, et al, is some sort of mental illness. Telling those who don't believe in gods to "make an appointment with a psychiatrist" or calling them "schizophrenic" is highly inappropriate. Not only does it suggest that your path is the only path when it clearly isn't - there's many on the non-theism spectrum practicing their beliefs just fine - but it mocks mental illness and adds to the stigma surrounding it. If you come back to post, I would suggest using other wording the future. You're welcome to debate - you are not welcome to be hurtful.